Illustration by Ju gatsu mikka. I did something unusual as a graduate student of psychology. While all my colleagues were studying ways that people can become miserable, I was interested in what makes people joyful and happy. When I would tell my professors or colleagues that I wanted to study joy for my dissertation, a typical response was a belittling chuckle. But within the past 10-15 years, joy has become a hot subject (Robbins, 2008), and people are not laughing anymore when I tell them I study joy. Well, they do smile though—but in a good way. In my research on joy (Robbins, 2006), participants describe the feeling as emerging from a felt, embodied sense of being centered or balanced, and as a warm, powerful, energized feeling that moves up and outward within the body toward the world. Whether in the presence of others or not, participants describe the feeling of joy as an experience that makes them feel more connected to, closer to, or intimate with others. The social function of joy may help explain why people with high scores on measures of well-being tend also to be extraverted (Diener, Sandvik, Pavot, & Fujita, 1992). Those people who are more socially motivated may be more compelled to express positive moods in order to initiate and sustain engagement with other people. Given that joy seems to be linked to such an interpersonal experience of connection, it may be less surprising that those without joy in their lives seem to be those who lack the ability to initiate or sustain meaningful connections with other people (Ryan & Deci, 2001). In fact, one of the best predictors of low satisfaction in life is a condition now referred to as alexithymia (Palmer, Donaldson, & Storsh, 2002; Mattila, Poutanen, Kovisto, Salokanga, & Joukamaa, 2007). Alexithymia is measured by a type of survey instrument, a scale called the Toronto Alexithymia Scale, or TAS-20 (Kooiman, Spinhoven, & Trijsburg, 2002). People who score high in alexithymia have problems with the experience and processing of emotions. They have difficulty identifying their own emotions and the emotions of others, and they have problems with describing feelings. They also tend to avoid thinking about emotional subject matter, and they try to keep their thoughts and conversations as shallow and non-threatening as possible. People high in alexithymia tend to have serious social difficulties (Vanheule, Desmet, Meganck, & Bogaerts, 2006; Spitzer, Siebel-Jurges, Barnow, & Grabe, 2005). These social problems seem to be directly linked to a central feature of alexithymia—what might be called a kind of empathy blindness. Even when well-intentioned, people with alexithymia find it extraordinarily difficult to understand or take on the perspective of others, and as a result, they tend to come across as self-centered and offensive. For example, people who are high in alexithymia also score low on a measure of empathy called the Interpersonal Reactivity Index (Guttman & Laporte, 2002; Grynberg, Luminet, Corneille, Grezes, & Berthoz, 2010). Try as they might, they simply remain blind to the perceptions and feelings of others, and as a result, their emotional responses to others are generally skewed and awkward. As it turns out, when brain imaging studies have been done on individuals high in alexithymia they actually show deficits in the areas of the brain linked to social functioning, such as recognition of facial expressions of emotion (Moriguchi, Decety, Ohnishi, Maeda, Mori, Nemoto, & Matsuda, 2007; Moriguchi, Ohnishi, Lane, Maeda, Mori, Nemoto, & Matsuda, 2006). 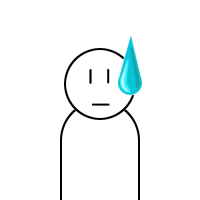 In addition, the person with alexithymia has difficulty with predicting how he or she will feel about events in the future, and this impairment negatively impacts decision-making (Robbins & Walker, 2008). The alexithymic person suffers not only empathy blindness, but performs poorly at affective forecasting. For example, those high in alexithymic traits tend also to have high materialistic values, and as a consequence, tend to choose material gain over relationships (Robbins & Walker, 2008). Those high in materialistic values, in turn, tend to have more negative emotions (Kashdan & Breen, 2007), especially envy (Richins & Dawson, 1992; Schroeder & Dugal, 1995), and experience a greater degree of personal distress (Burroughs & Rindfleisch, 2002; Vansteenkiste, Duriez, Simons & Soenens, 2006). These dispositions are reflected by the materialist’s higher scores in neuroticism (Sharpe & Romanaiah, 1999), which reflects emotional instability. As a result, they tend to be more vulnerable to mental dysfunction such as depression and anxiety (Kashdan & Breen, 2007), as well as characterological problems such as narcissism (Netemeyer, Burton & Lichtenstein, 1995; Rose, 2007). Materialists are also at risk for having deficits in a variety of positive indicators of well-being (Vansteenkiste, et al, 2006; Kasser & Ahuvia, 2002), such as subjective well-being, self-actualization, vitality and global functioning (Kasser & Ahuvia, 2002). They also score lower in character strengths such as autonomy, competence, meaning in life, self-esteem, and trait gratitude (Kashdan & Breen, 2007; Meek, 2008; Richins & Dawson, 1992). The relationship between material values and negative indicators of well-being has been found to be fully mediated by alexithymia (Robbins & Walker, 2008). Due to poor interpersonal connections and empathic blindness, alexithymics also have poor insight into themselves, and make decisions that ultimately lead to a more joyless existence, sacrificing relationships that bring joy for material possessions that do not create a sustainable satisfaction with life. However, there is hope. Research studies indicate that both alexithymia and materialistic values can reduced through more mindful living which reduces experiential avoidance and deepens compassion for self and others (Gilbert, McEwan, Gibbons, Chotai, Duarte, & Matos, 2012; Baer, Hopkins, Krietmeyer, Smith & Toney, 2006; O’Neill & McMillan, 2012; Chawla & Ostafir, 2007; Kashdan & Breen, 2007). Those with tendencies toward alexithymia can engage in practices that enhance mindfulness, which over time, may deepen insight into the emotions of the self and others, and foster better personal values and enriching, satisfying relationships with others. No one need suffer a joyless existence—joy can be discovered with practice and the development of new habits. Baer, R. A., Hopkins, J., Krietmeyer, J., Smith, G. T., & Toney, L. (2006). Using self-report assessment methods to explore facets of mindfulness. Assessment, 13, 27-45. Chawla, N., & Ostafir, B. (2007). Experiential avoidance as a functional dimension of psychopathology. Journal of Clinical Psychology, 63(9), 871-890. Gilbert, P., McEwan, K., Gibbons, L., Chotai, S., Duarte, J., & Matos, M. (2012). Fears of compassion and happiness in relation to alexithymia, mindfulness, and self-criticism. Psychology and Psychotherapy: Theory, research & practice, 85(4), 374-390. Grynberg, D., Luminet, O., Corneille, O., Grezes, J., & Berthoz, S. (2010). Alexithymia in the interpersonal domain: A general deficit of empathy? Personality & Individual Differences, 49(8), 845-850. Guttman, H., & Laporte, L. (2002). Alexithymia, empathy, and psychological symptoms in a family context. Comprehensive Psychiatry, 43(6), 448-455. Kashdan, T. B., & Breen, W.E . (2007). Materialism and diminished well-being: Experiential avoidance as a mediating mechanism. Journal of Social & Clinical Psychology, 26(5), 521-539. Kasser, T., & Ahuvia, A. (2002). Materialistic values and well-being in business students. European Journal of Social Psychology, 32(1), 137-146. Koiman, C.G ., Spinhoven, P., & Trijsburg, R. W. (2002). The assessment of alexithymia: A critical review of the literature and a psychometric study of the Toronto Alexithymia Scale-20. Journal of Psychosomatic Research, 53(6), 1083-1090. Mattila, A. K., Poutanen, O., Kovisto, A.M., Salokanga, R. K. R., & Joukamaa, M. (2007). Alexithymia and life satisfaction in primary healthcare patients. Psychosomatics, 48(6), 523-529. Meek, W. D. (2008). Pathways to materialism: Examining self-esteem as a moderator. Unpublished doctoral dissertation, University of Missouri, Kansas City, MO. Moriguchi, Y., Decety, J., Ohnishi, T., Maeda, M., Mori, T., Nemoto, K., Matsuda, H., & Komaki, G. (2007). Empathy and judging other’s pain: An fMRI study of alexithymia. Cerebral Cortex, 17(9), 2223-2234. Moriguchi, Y., Ohnishi, T., Lane, R. D., Maeda, M., Mori, T., Nemoto, K., Matsuda, & Komaki, G. (2006). Impaired self-awareness and theory of mind: An fMRI study of mentalizing in alexithymia. NeuroImage, 32(3), 1472-1487. O’Neill, M., & McMillan, T. M. (2012). Can deficits in empathy after head injury be improved by compassionate imagery? Neuropsychological Rehabilitation: An International Journal, 22(6), 836-851. Palmer, B., Donaldson, C., & Storsh (2002). Emotional intelligence and life satisfaction. Personality & Individual Differences, 33(7), 1091-1100. Robbins, B. D. (2006). An empirical, phenomenological study: Being joyful. In C. T. Fischer (Ed. ), Qualitative research methods for psychologists: Introduction through empirical studies (pp. 173-211). Burlington, MA: Academic Press. Robbins, B. D. (2008). What is the good life? Positive psychology and the renaissance of humanistic psychology. The Humanistic Psychologist, 36(2), 96-112. Robbins, B. D., & Walker, L. (2008). Does alexithymia mediate the relationship between materialism and neuroticism? In B. D. Robbins (Chair), Materialism and psychological well-being: Contemporary research & ancient wisdom. Symposium conducted at the 116th Annual Convention of the American Psychological Association, Boston, MA. Ryan, R. M. & Deci, E. L. (2001). On happiness and human potentials: A review of research on hedonic and eudaimonic well-being. Annual Review of Psychology, 52, 141-166. Schroeder, J. E., & Dugal, S. S. (1995). Psychological correlates of the materialism construct. Journal of Social Behavior & Personality, 10(1), 243-330. Sharp, J. P., & Ramanaiah, N. V. (1999). Materialism and the five-factor model of personality. Psychological Reports, 85(1), 327-330. Spitzer, C., Siebel-Jurges, U., Barnow, S., Grabe, H. J., & Freyberger, H. J. (2005). Alexithymia and interpersonal problems. Psychotherapy and Psychosomatics, 74(4), 240-246. Vanheule, S., Desmet, M., Meganck, R., & Bogaerts, S. (2006). Alexithymia and interpersonal problems. Journal of Clinical Psychology, 63, 109-117. Vansteenkiste, M., Duriez, B., Simons, J., & Soenens, B. (2006). Materialist values and well-being among business students: Further evidence of their detrimental effect. Journal of Applied Social Psychology, 36(12), 2892-2908.